First and foremost, I want to make it known that I am not a Quentin Tarantino fanboy by any sense of the word. I thought Inglourious Basterds sucked, I’m not a fan of Kill Bill, and although I enjoyed Pulp Fiction I don’t consider it one of the best movies of all time. With that said, Django Unchained was as entertaining if not better than Pulp Fiction. Before you flip your lid, keep in mind I was fed plenty of booze at the press of the button and had an incredible viewing experience. Regardless of how much SMG enhanced the film for me, it had star power, one liners, and of course, all the gratuitous blood and violence you come to expect from any movie Quentin Tarantino’s name is attached to. I can say with confidence that Django Unchained is easily the first must-see movie of 2013. If you are turned off by racist humor and/or excessive violence, this movie is not for you. This movie contains over-the-top use of the n-word, people are blown up, a man is ripped apart by dogs, and there’s even a scene where two slaves fight to the death for their owner’s entertainment. The film is not for the faint of heart, and I can see how some people wouldn’t enjoy it. But if you’ve seen Tarantino’s other films, you’re more than aware that going in to Django Unchained you’re most likely going to see things that shock and/or disgust you. I thought Jamie Foxx gave a powerful performance and Leonardo DiCaprio killed it in his supporting role. The highlight of the film, however, had to be Samuel L. Jackson’s character “Stephen”. The guy absolutely nails it as he delivers some of the most hilarious (although self-loathing) one-liners in the movie. Django Unchained is worth the price of admission for Samuel L. Jackson’s performance alone. If I have one gripe with the film, it’s the sheer length of the movie itself. With a running time of 165 minutes, I felt like I was in the theater all night and missed a portion when I had to “break the seal” so to speak. While my date told me I didn’t miss anything, I still think 165 minutes is too long for a movie and some of the less important scenes could have been left out. 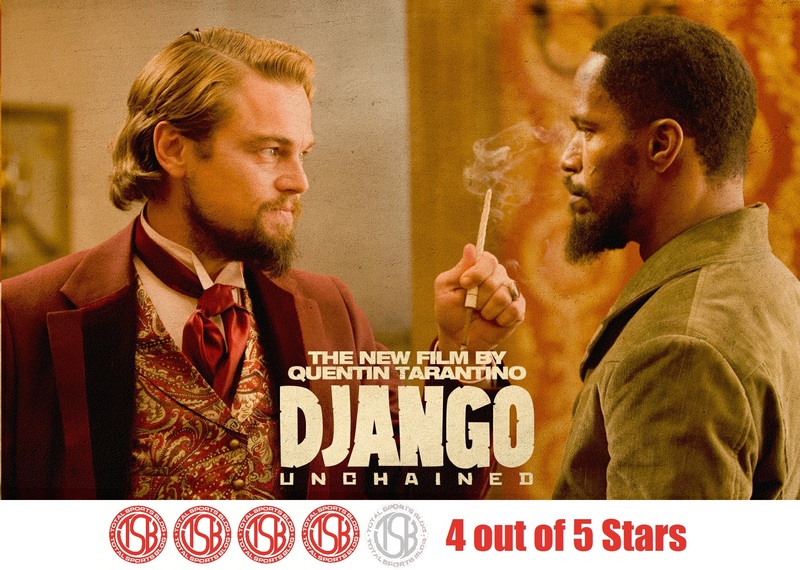 Regardless, Django Unchained receives a strong 4 out of 5 stars and is definitely worth the trip to the theater.